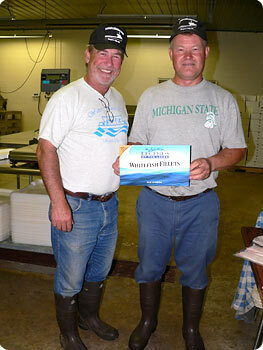 John and Tom Holding Legends™ of the Lakes PackageIt’s been more than a hundred years since John Gauthier’s ancestors began fishing in the Great Lakes near Two Rivers, Wisconsin. He was about 10 years old when he started working gill tugs with his family near Fairport on the Garden Peninsula in northern Lake Michigan. He remembers how sick he used to get on rough days, but he kept at it. He met Tom Spaulding in high school; the two became best friends, and John taught Tom to fish. More Information: The Life of a Commercial Fisherman, Gauthier & Spaulding Fisheries, Inc.